Unofficial survey. Your answers will not be shared. That’s because you’ll keep them to yourself. I want my players to be smart hockey players. I want my players to know when to angle (or not) and by how much. I want my players to know how to find a seam for a pass. I want my players to be able to go to a space to receive said pass. I want my players to read a defender’s body position and react appropriately. I want my players to understand that a gap isn’t just a store and know when to close it. I want my players to exit our zone by first looking for pressure and reacting accordingly. Of course, the full survey includes more statements about neutral zone play, specialty teams and so on. How much you want their IQ to increase depends on their age and level, not yours. This is a significant difference. Our impatience as coaches with how much kids understand about the game is probably one of our major coaching issues. It seems perfectly fine to realize a grade 5 ten-year-old might be able to cobble together a few sentences into a semblance of a paragraph. That child is not yet able to determine a single theme from Shakespeare’s Macbeth, let alone write a couple of hundred words about it. Coaches can do a great deal to improve players’ IQ, even in simple skill drills. For instance, when doing balance or other manoeuvres the length of the rink, players are often directed to do the exercises at specified lines. Why not have an assistant at the far end raising his stick in the air to indicate a rep? Now the players need to watch and react. Pre-determined routes using pylons have their place in skills instruction in that they allow for repetition in a blocked practice format. Remove the pylons and try making the kids do the skill every X number of seconds. Now they have to put their brains into gear along with performing the skill. When teaching tactics of any sort, offer varying degrees and types of resistance. Even passive resistance from a player pushing his stick blade into a puck handler’s path is enough to make the attacker read and react. After a few reps, adjust the resistance, like loosening or tightening a bolt. One way is to add movement to the resisting player. Another is to add distractions, like tossing pylons into the attacker’s path as he approaches the defender. 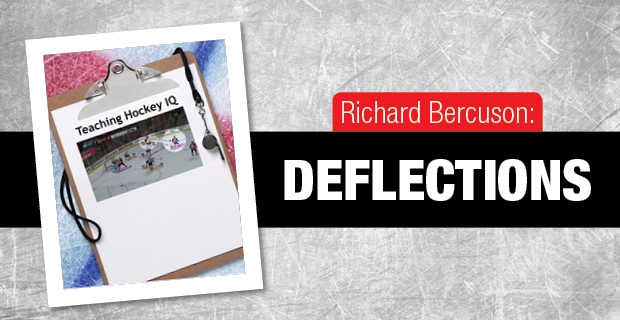 If you want players to think, or develop their Hockey IQ, telling them what to do won’t cut it. Instead, show them how by changing the parameters of a drill or putting them in situations where they must think. Over time, you will see a positive change.